You can't say you've seen the Amalfi Coast until you've seen it by sea! A boat trip along this stunning stretch of coastline is the best way to discover one of Italy's most beautiful spots, where the towering cliffs, picturesque fishing villages, and sparkling turquoise Mediterranean combine to form a stunning seascape. The departure point for these types of boat trips is usually the port of Sorrento, though you can also set sail from Piano di Sorrento or Massalubrense. From Sorrento, you can skirt the coast and admire the remains of the Roman villa of Pollio Felice directly on the coastal cliff, the tiny village of Puolo, the hamlet of Marina della Lobra, and the Punta Campanella nature reserve. Here you can stop for a swim in the tiny coves which dot the coastline. Once you have rounded the cape at Punta Campanella and seen the Greek tower dedicated to the goddess Athena, you can continue into the Gulf of Salerno where the Amalfi Coast begins. The first town you will pass is Nerano, famous for its excellent seaside restaurants. If you stop for lunch here, make sure to sample the beloved "spaghetti alla Nerano", tossed with zucchini and cheese. Your sail continues along the route taken by Ulysses, passing first the Li Galli islets, home to the legendary sirens. Whether or not the story is true, the islets are truly magical, and the largest was purchased by the Russian dancer Rudolf Nurejev and is home to his private villa where he spent his final years. 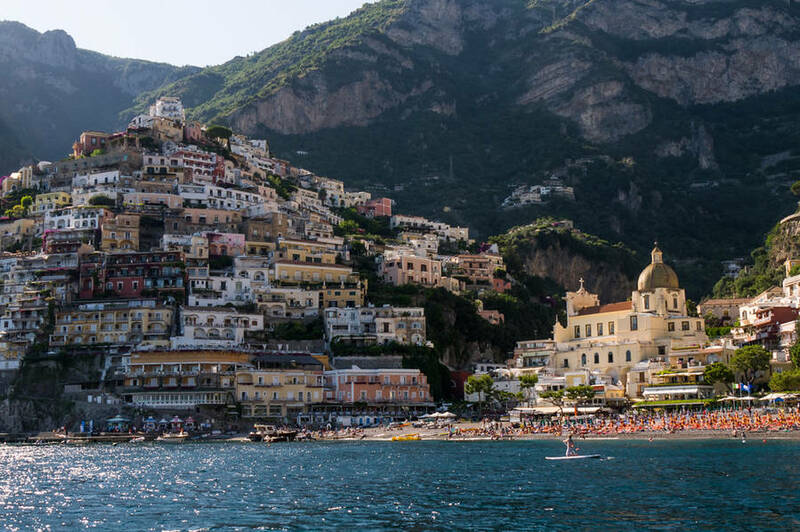 Afterwards, you'll sail to Positano; if you've rented a boat with skipper or are with a group tour, you can disembark for a walk through the center of town. It takes about an hour to sail from Positano to Amalfi, where you should stop to visit the stunning Duomo di Sant'Andrea. Amalfi is the final stop before returning to Sorrento along the lovely coastline.